Read about Alice and her adventures with a crazy horse. A charming village story about a little girl, a dare gone wrong and one crazy animal! When Alice Brett moves from the city to a little village school, she's never seen a real live horse before. 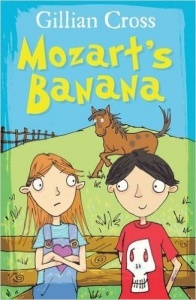 And famous village resident Mozart's Banana is not just any old horse - he's crazy! The children are banned from riding him, but when Sammy Foster dares Alice to get on Mozart's Banana's back, she takes it very seriously...just what does she have up her sleeve? A fun comedy about a girl and a very special horse!